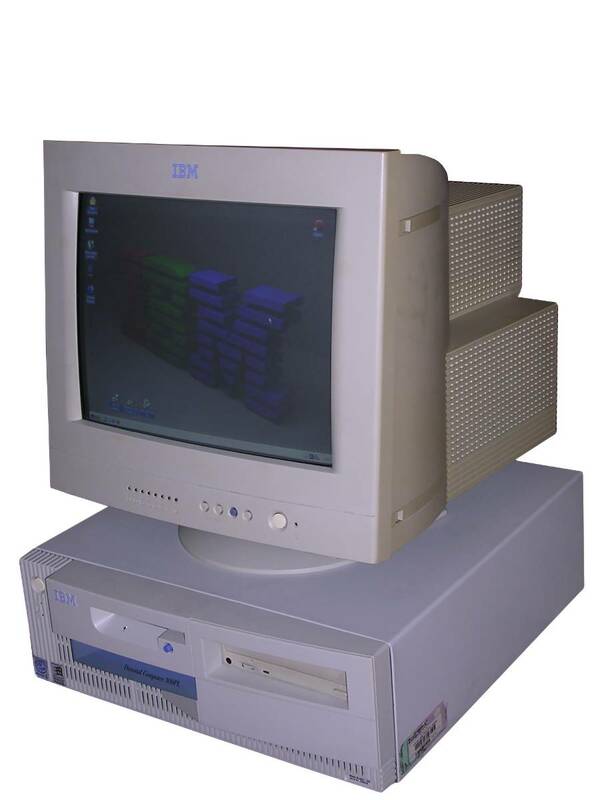 This is one of the last computers marketed as PC series by IBM. IBM revived their PC brand in 1990s, after high-end PS/2 and ValuePoint lines of PC-compatibles. First models were equipped with 486 (only "budget" ones) and Pentiums of different speeds. Different models had configurations with amounts of RAM, expansion boards and number/types of slots. Usually most PC series were supplied in desktop casing, yet IBM tried to make every line in series have its tower equivalent. The PC brand has been finally ended in 2000, when it was replaced by NetVista machines. This PC 300PL is one of the last computers from PC line, made around 2000. It has a Pentium III 667MHz Slot-1 processor and upgradeable 128MB of RAM. It was sold in set with IBM G-series display, keyboard and mouse. It was available with variety of video cards, from S3 Savage to 32MB TNT2 in AGP slot, and most of models had USB ports in mainboard. Although officially most of PIII machines had at least 20GB hard disk, some units made for Europe had 10GB as hard disk's capacity was there not directly shown in advertisements. Operating system(s): MS Windows 98SE. My unit has been used as a spare one in control room, so it is in a relatively good shape. Later it was briefly used as home computer, but quickly retired because of its monitor overheating. While it was not a problem in air-conditioned environment, in warm days, where ambient temperature is sometimes near or over 30 degrees centigrade, it started to be a problem. It boots with IBM BIOS, can boot from different media, CD-ROM, floppy or network too. 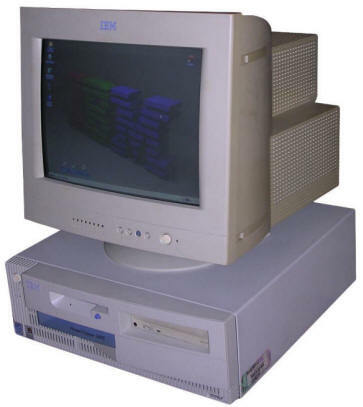 These computers were supplied with Windows 98SE, rarely Windows NT (as it doesn't suport on-board USB), yet with this Pentium III Windows 2000 can be used too. Drivers for nVidia TNT2 M64 can be found on nVidia archive page. Warning: Many PC 300PL sets have been sold with G51 CRT monitor (Type 6541-Q0E, G, N or S, 6541-02E, N, or S). Avoid using this monitor longer than for a few hours and pay attention to it while running. This display is so crudely made that it overheats easily. Yes - CRT display of late 1990s, very stabilized technology, can overheat, it's just awfully manufactured, even plastic molds are not straight. In USA, IBM even replaced them (see this announcement), but outside USA they took a Dell's method: "it's-user's-fault" as well as covered the incident by "confidential information" excuses. So - excessive heat in the rear - TURN IT OFF. Colours "floating" - definitely TURN IT OFF because there may be a smoke next. Let it cool down for a few hours and you can go again. This is just a terribly overheating thing. I found that there are at least 2 points in which heat is bigger than in typical monitor: Deflection coils (can discolour of overheating) and a big heatsink near power supply section. Upgrading warning: Although IBM offered these machines in configurations up to 866MHz, Slot 1 machines are not easily upgradeable with CPUs over 700MHz. Usually different problems with stability arise from such upgrades, especially when using converters.